Off Lease Only What's In Your Driveway Winner Chooses New Ride! Off Lease Only What’s In Your Driveway Winner Chooses New Ride! Livi Dalmau didn’t believe it at first when she got the call from Off Lease Only telling her that she had just won a $20,000 voucher toward the purchase of any of the more than 6,000 vehicles in inventory at the nation’s largest-volume independent used car dealership. 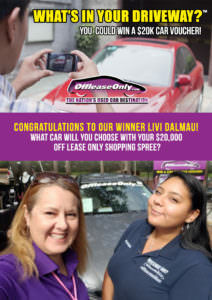 Once she discovered that she was indeed the winner of Off Lease Only’s “What’s In Your Driveway” online promotion, Livi set about letting people know. Livi was one of nearly 10,000 people nationwide who sent in a photo with a car during the month of November in hopes of winning the $20,000 Off Lease Only “What’s in Your Driveway” shopping spree — and her entry came on the spur of the moment. Livi’s Winning Selfie with Karina an extraordinary OLO customer service associate! Livi and a friend had gone to the Business Give Back in the Park event in mid-November to support the Tamarac North Lauderdale Chamber of Commerce, which helped put on the gathering. When Livi walked by the Off Lease Only booth, she learned about the promotion and decided to enter, taking a photo with a car and submitting it online. She was familiar with Off Lease Only because her son had bought a car from the company and had been very happy with his purchase and experience. “Whenever I would see Off Lease Only, I always thought this is a good place to buy a car,” she said. 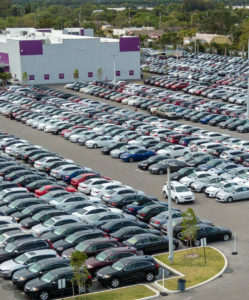 Livi, who will have her choice of using the voucher toward the purchase of more than 6,000 vehicles in the Off Lease Only inventory, says with so many choices, making a selection hasn’t been easy. She said she’s always wanted a luxury import — a Off Lease Only Mercedes or BMW — but needs to have a vehicle that’s practical as well. The Nissan Maxima Platinum caught her eye and was the perfect choice! 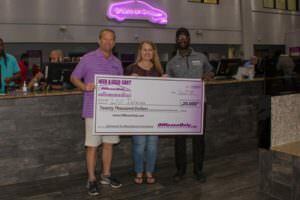 Off Lease Only Winner Presented her check at North Lauderdale Location! Mark Fischer, who with his wife, Eileen, founded the company, says the dealership plans to continue offering social media promotions with large prizes on a regular basis, so following them on Facebook, Instagram and Twitter is a very good idea. “We see this as one more way to use social media to connect with customers,” Fischer said. The promotion is also an opportunity for Off Lease Only to raise awareness and let shoppers know all the dealership has to offer. 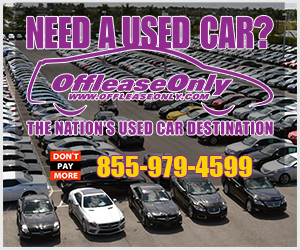 Off Lease Only’s selection is the most incredible selection of used cars, trucks, suvs and vans and they’re all priced thousands below retail! With a focus on customer satisfaction, Off Lease Only is among Edmunds.com’s Five-Star Premier Dealers based on customer reviews, has an A+ rating from the Better Business Bureau and is DealerRater’s Used Car Dealer of the Year- Florida. The company prides itself on transparency, offering a free five-day or 500-mile exchange policy and no hidden fees. 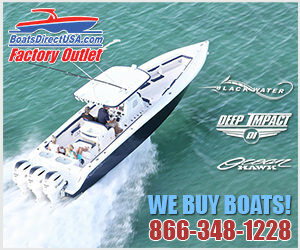 To find out more about great deals at Off Lease Only or to search the inventory, visit www.offleaseonly.com. Want to stop by in person? Simply click the image below for driving directions! ← Previous Story Online Used Car Giant Expands OffLeaseOnly Inventory into New York Market! Next Story → OffLeaseOnly to Bring More Than Twenty Luxury Vehicles to SuperCar Sunday SuperShow!